The takeover ceremony of the prototype inshore patrol vessel of the Croatian Navy was held in the Barracks "Fleet Admiral Sveto Letica –Barba" in Split on 7 December 2018, attended by the delegations of the Croatian Ministry of Defence and of the Croatian Armed Forces headed by the Deputy Prime Minister and Defence Minister Damir Krstičević, and by the Chief of General Staff of the Croatian Armed Forces General Mirko Šundov, and of the manufacturer company "Brodosplit" headed by CEO Tomislav Debeljak, who were joined by members of the organisational units of the Croatian Navy and other services of the Croatian Armed Forces, the retired commanders of the Croatian Navy and by representatives of the associations from the Homeland War and of the local authorities. The Inshore Patrol Vessel 31 "Omiš" s godfather is Roko Vranić, father of Josip Vranić - the first fallen member of the Croatian Navy and the first victim of the Homeland War in Split The handover was concluded witrh the Handover Report. Defence Minister Damir Krstičević in his address emphasised that the vessel – a work by Croatian experts in a Croatian shipyard – would significantly upgrade the Croatian Coast's capabilities and that the Ministry of Defence and the Croatian Armed Forces again proved to be generators of the economy development and reliable partners to the Croatian businesses. ORH and HV once again demonstrated that the generators of economic development and a significant partner our companies. "The Croatian industry, supported by the Ministry of Defence can further upgrade the capabilities of the Croatian Armed Forces, the complex systems such as large ships included". The Minister also reminded of the importance of the Croatian Navy for the security of the Adriatic Sea. "The establishment of naval infantry company, the return of a Croatian Armed Forces unit to Ploče, the launching of the Naval Studies, the procurement of the engine for the missile boat and the delivery of ring a rocket launcher engine and delivering a coastal patrol boat, we return to the Croatian Navy the victorious glow it had during the Homeland War," concluded Minister Krstičević. "The new inshore patrol vessel will enable Croatia's Coast Guard perform its tasks the same as the modern world coast guards. 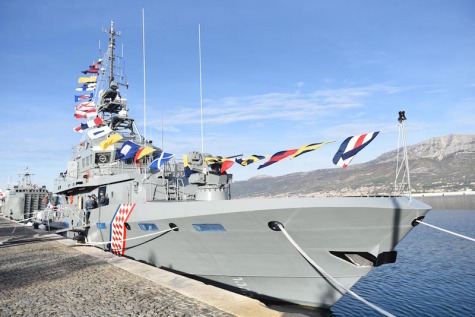 By completing the first of the five planned inshore patrol vessels the Croatian Navy has acquired new capabilities "Omiš" is a Croatian product, a result of enormous efforts and knowledge of the Croatian experts," said General Mirko Šundov. The Croatian Nayy Commander Commodore Ivo Raffanelli underlined the extensive tests preceding the handover "All appliances and systems repeatedly underwent thorough tests, to get an insight into the vessel condition. Today we are embarking on a 5-month second testing phase, during which the vessel will be tested to the limits to certify that it fulfills the tactical and technical requirements. The "Brodosplit" CEO Tomislav Debeljak said the handover of the first designed and constructed vessel in modern Croatia was a special event. "Our appreciation goes to all those included in the project. We have invested significant efforts and I hope we are embarking ona bright future for all of us,” said Tomislav Debeljak. The ceremony was followed by a brief sail through the Kaštela Bay, during which they observed some of the capabilities of the vessel "Omiš", with a 16-member crew commanded by Lieutenant (N) Ante Silić. The main purpose of the vessel will be patrolling for control and protection of the interests of the Republic of Croatia at sea, as well as proiding support to the island population, and search and rescue at sea. In the event of war the vessels may be used for protection of internal waters and for combat and logistic support. The prototype vessel is over 43,25 m long and is fitted with the 30-mm automatic gun and two manually operable 12,7-mm machine guns and four portable air defence rocket systems. 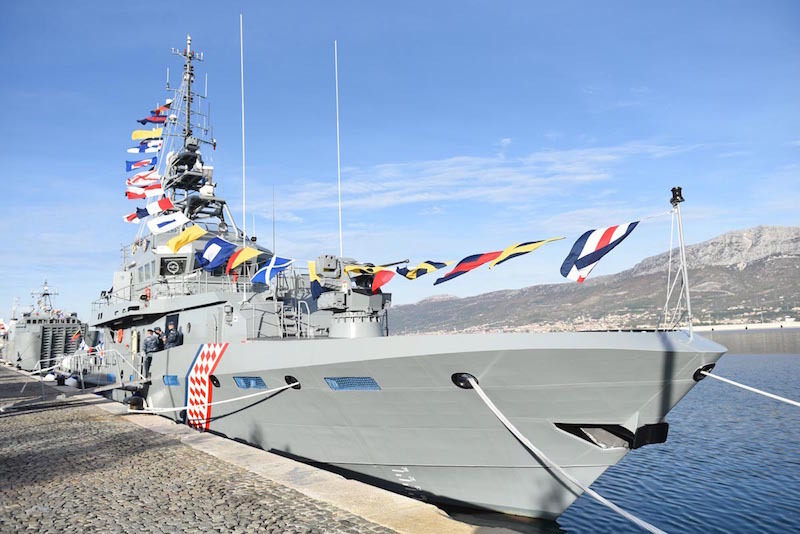 The introduction of the inshore patrol vessel into operational service is another project modernisation and development of new capabilities of the Croatian Navy.